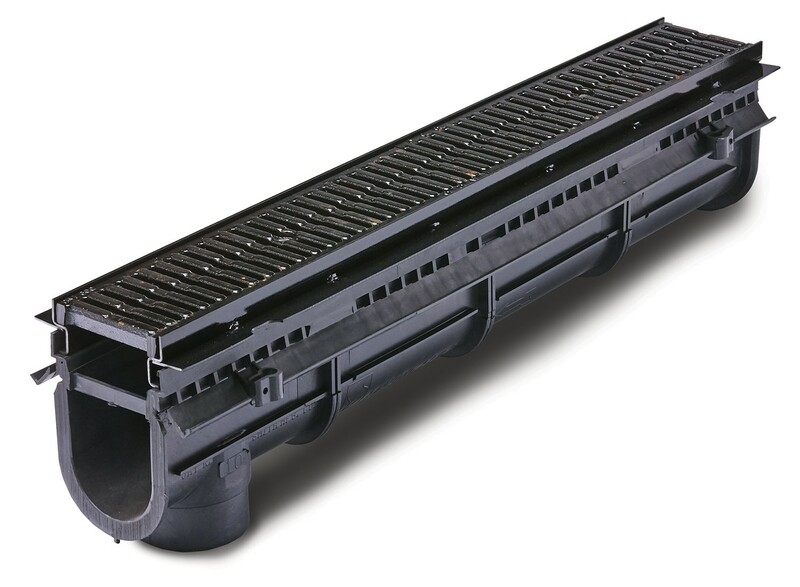 9931 - Enviro-Flo II Extra Heavy Duty Trench Drain System - Jay R. Smith MFG Co.
Used in all surface drainage, may be assembled in any length utilizing steel frame system that is recommended for situations requiring an extra heavy duty rating to protect against hard wheel traffic, impact of steel containers, struts and metal wheels. No charge precut channel inserts for protection and easy cleanup and properly sized for concrete pour. Easy tongue and groove interlocking channel and end cap system. More time savings for the installer. 4” integral molded bottom outlet on every channel - labor and material savings. Each side of the channel has a piece of steel embedded above the flange – this prevents any warping or bowing in the Enviro-Flo® channel. Directional changes are achieved by simply cutting off the male ends which are attached together with a few provided screws. Variety of grates and frames for light duty to extra heavy duty applications and pockets in the channel to provide a positive lockdown. QuickLock® grate locking system makes grate assembly literally a snap. Clips and hardware provided on every channel for pre-assembling the channels. Polypropylene is more chemical resistant and the joint can be welded. 1 Meter (3.28') 100% Polypropylene Industrial Recycled Material with U.V. Inhibitors. Channel of Interlocking Design with a Built-in Slope of 0.6% with Radiused Bottom along with Steel Frame Support System and (8) Galvanized Concrete Anchors. Supplied with Secured Grate.